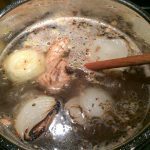 Devi, my sister, makes this Pho for Cancer: Pressure Cooker Bone Broth for her family to drink to strengthen their immune system. Please support her cancer fundraising. Devi has had a huge impact on my food philosophy and inspires me constantly, both in the kitchen and out. 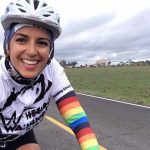 This is the second year that she has been involved in The Ride to Conquer Cancer, a 250 km (155 miles) ride over two days to raise money for cancer research and care. 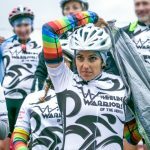 I encourage you to take a look at her The Ride to Conquer Cancer profile page and we'd love it if you would also support her via donations to the Ride. We've all been affected by cancer in one way or another. And please share via social media (links above and below)! Devi makes bone broth for her family to drink on a regular basis. 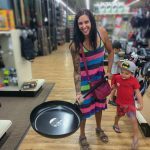 She loves the flavor of the Pho bone broth, and often adds ingredients to make a normal Pho soup. 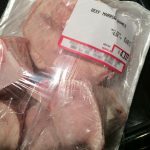 1 – 1 1/2 lbs bones – You can use beef, ox tail, or turkey necks, or a combination. Combination is great, and ox tail is my favorite for flavor, but just use whatever you have in your freezer. I use whatever I can fit in the IP. 1-1.5 lbs is probably good. Spices – I don't usually measure …so I'm guessing the amounts. Chop 1 or 2 onions in half. Chop 1 piece of ginger in half lengthwise, so that the good stuff is showing. Broil in oven onions and ginger until charred – maybe 10 min or so. Have your fan on so everytime you check your smoke detector doesn't go off. While all this is going on, get out your spices. In a non-stick pan, combine all that on low heat until they are fragrant – 3-4 min. 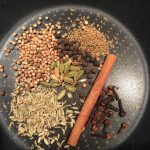 Always stir – burnt spices will wreck everything. Turn Instant Pot onto SAUTE and wait for it to heat up. Add some coconut oil and brown your bones. You will brown these bones on all sides [turn as needed]. As you are doing this, boil water in kettle – this makes the process faster. Once your bones are browned, turn IP off. Add boiled water, onions and ginger, spices and fish sauce, and salt to taste – probably 1-2 Tbsp. Fill remainder of Instant Pot with boiled water to max line (or cold water, it'll just take longer). 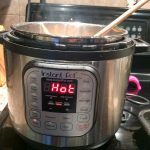 [Turn InstantPot to] manual setting for 75 min and use a slow pressure release. Strain and put into jars. I like to freeze mine and thaw them as needed. 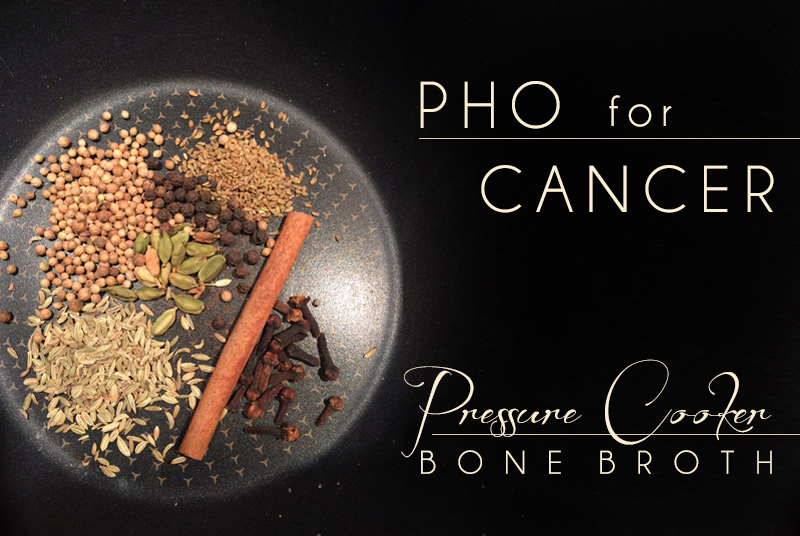 I was pretty entertained by Devi's wording on the Pho for Cancer – Pressure Cooker Bone Broth recipe. Great write up. Love the pictures and the video. I hope the weather is better for this year’s ride. 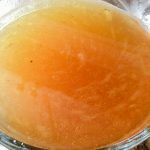 My mother always used an ox-tail broth base for her soups simply because she didn’t want to waste anything. She probably had no idea how nutritious that broth was. And little did she know her grandchildren would be making this for themselves and her great grandsons! Good luck on your ride Devi, and thanks for sharing you recipie. Looks tasty, I don’t have oxtail, hopefully a shank will substitute nicely. The broth looks delicious. I don’t eat meat anymore, but I still remember the soothing taste of chicken or beef broth. 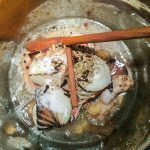 Great write-up and recipe! I love making stocks and broth. It makes the house smell so good. Adding spices like cinnamon to broth is new to me. I’ll have to try. It looks delicious! I have been meaning to find a tasty, authentic pho soup recipe for the upcoming fall months! This is perfect! And what a wonderful thing your sister is doing – nothing better than getting a little physical activity in while helping others!! Thank you for sharing. I’ll certainly give the broth a try. 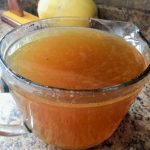 The recipe sounds great .I will be giving this bone broth a try.Thanks for sharing.I believe a healthy lifestyle and boosting immunity can go a long way in living healthy.It’s great that you spread cancer awareness. This looks like just the thing to sooth my upset stomach. Need to get some of those spices, can’t wait to get this in my belly. Hope you’re feeling better Aimee! Making the soup now, and still a novice with the IP. That is 75 mins with high pressure? There is also a low pressure button, but you just said slow release, so not low pressure for cooking correct? Manual high pressure then natural pressure release (don’t flick the release valve). How are you feeling? How was your bday? How’s the challenge treating you? Awesome thanks! It has 45 mins left to go My bday was good, we went into Canada on Saturday to go to Niagara on the Lake, but it has a bit brisk, but all of the lilacs and and flowering trees were just gorgeous! Challenge is ok, I had not given it 100% yet, due to not feel so great this week, but am just about recovered and ready to be a bit more disciplined. How about you, are you finding it difficult? What nutrition plan are you following? Oh that sounds like a pretty trip. Challenge has been great! Definitely more aware of my habits. The performance or whatever the most difficult nutrition one. Essentially strict paleo without syrup, honey, coconut sugar, potatoes, and sugar/nitrate-containing bacon. Aimee you’re the best! Glad you’re feeling better. I’ll let Devi know. Aimee!! So glad you’re liking it!!! I feel like I should go make some right now…… 😉 I’d love to be sipping some pho tonight! I poured it over my blanched julienne daikon since I try my best to stay away from white carbs. oh my oh my it was rich in flavor. That’s a great testimonial right there! 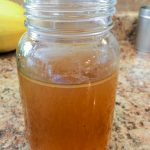 I’ve been making lots of bone broth the last fee weeks now that the weather is cooling off. Sounds so good, I’m going to make it this weekend! 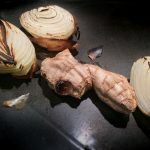 Do you think the cinnamon, star anise, cardamom, and clove flavors will become too strong and overpowering in 2-3 rounds of 75 minutes in the pressure cooker (what I typically do for bone broth)? Hey Laura, how do you mean 2-3 rounds? Why not just do 2.5-3.5 hours? Is that what you’re saying you do? Or do you do 3 separate batches using the same bones? Yes, that’s what I mean! 3.5 hours. Will the spices be overpowering? You’re guess is as good as mine. My guess is… that it will be ok.
I’m curious why you’re doing it as 3 rounds. Anyway, please let us know what you end up doing and what the outcome is!